Ever since Shannon shared some of his rabbit-raising adventures, I've been wanting to taste rabbit meat. So I was thrilled when a frozen rabbit showed up on my door step, courtesy of my cousin-in-law's mother, who had the rabbit given to her in exchange for free legal services. I didn't know anything about the rabbit --- was it young or old; wild-caught or farm-raised? So I opted to slow cook it in a Dutch oven at 300 degrees for ninety minutes to ensure palatability. On Mark's advice, I first marinated the meat in teriyaki sauce (which I should have done with our failed squirrel taste test). The result? Delicious! The rabbit came parted out, and Mark and I shared pieces of what would be the breast and wing on a chicken. Both tasted very much like the relevant parts of a chicken, in fact, although I thought the rabbit foreleg was much better than any chicken wing I've ever eaten --- moister and richer in flavor. The aroma while cooking was also enticing, and I can't wait to make a broth out of the bones. That one rabbit created quite a lot of meat. We've probably got enough left for another three or four meals for the two of us. While we're not adding new livestock to our farm anytime soon, this taste test suggests that rabbits could definitely be on our culinary list if we found a good source. Our chicken waterer keeps hens healthy so they lay more eggs. Hello from Southern Ontario Canada! Another interesting bit of information I heard about rabbits is that rabbit poo can be used in the garden immediately after it is created. Apparently it doesn't have the dangerous bacteria or the potential to burn crops like other forms of animal manure. I think this must be a young one because it is quite a bit smaller than some I've seen running around. Beautiful, healthy liver, so I'm guessing I won't keel over if I cook it up. My parents are coming to dinner, so I was thinking of pan frying it for the first try. I don't know if I'm hoping there will be more or not. Tom B is correct about the manure, it can be used immediately and is plentiful. Rabbits are really easy to raise. Maybe not as easy as free range chickens, but still not difficult. You do have to provide rabbits more feed than free range chickens so I think that brings the cost of raising them up. We do bring in a good hay for ours and they waste some, but I just add that and the manure to the garden. Unlike wheat straw it doesn't usually sprout and is great mulch. The only difficulty we have is when the heat is very extreme. We mostly make stews, or dishes like curry. With the next batch I'm going to try more frying and grilling. 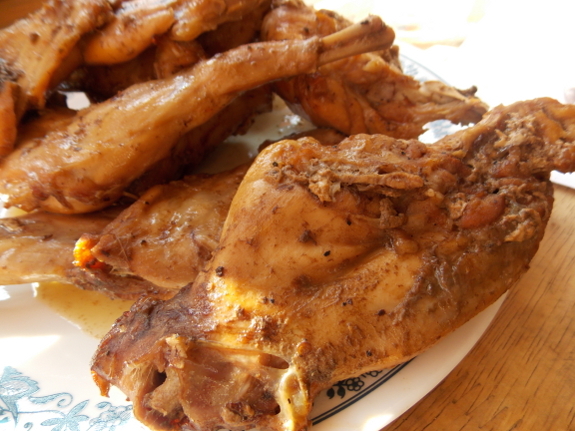 I've found you can pretty much substitute rabbit for chicken in any recipe. The nice thing about meat rabbits is that they're much faster and easier to process than chickens. They also grow out faster, unless you opt for the freaky Cornish Cross meat birds. Rabbit meat is seen as a bit of a specialty meat around here (Australia) - selling in butchers for around $20 for a small (0.7-1.2 kg dressed) wild one, up to $35 for a large (1.8-2.0 kg dressed) farmed one. You can also get a good price for live rabbits as meat breeders or pets, although it does take some delicate diplomacy when dealing with pet-buyers as they're often horrified at the thought of you eating rabbits! Darren --- It's not really a coincidence. I got busy last week and stuck our rabbit in the freezer, then when I saw your post, I remembered it and thawed it out. Thanks for the reminder! I just posted about my first experience processing rabbits, as well. Now that I've got a fresh bunny in the freezer, I'm not exactly sure what to do with it. The dutch oven sounds like a safe first attempt. Could you share some more details on how you cooked it? I tend to be more of a recipe guy than a natural when it comes to cooking. Thanks for all your posts. I get a lot of encouragement from your site. Ant Farm --- Hmmm, a recipe, huh? 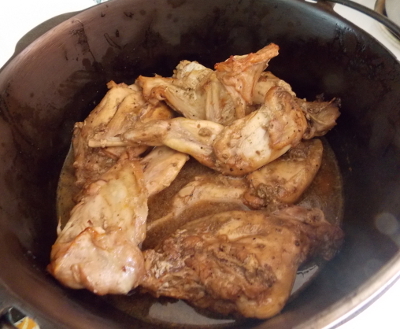 If I remember right, I put the thawed rabbit in the Dutch oven and poured about a third of a bottle of teriyaki sauce over it. I brushed the teriyaki sauce to evenly cover the meat, put the whole thing in the fridge, then flipped the meat over and brushed it again about an hour later. After another hour, I put it in a 300 degree oven with the lid on and cooked for 90 minutes, probably taking it out to brush the juices over the meat and flip them around two or three times in the middle. I figured it was done when the meat started to pull away from the ends of the leg bones. What I can't remember is whether I added anything extra to the marinade. Things I might have added, but don't recall adding, include a bit of salt (but I often figure teriyaki sauce is salty enough by itself), pepper (ditto), and balsamic vinegar (which I sometimes add to cut the sweet of the teriyaki sauce). I think I didn't add any of that, though, and kept it really simple. Good luck with eating up your first bunny!